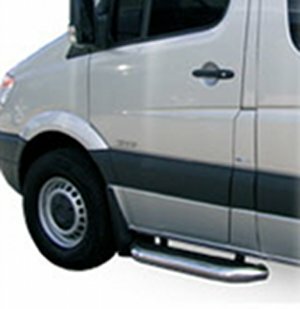 Ford E Series Van Cut-a-way Cab Stainless Steel trim steps. Each set includes two 36 inch steps (1 for driver side and 1 for passenger), mounting brackets and instructions. Steps have molded tread inserts. 2001 - on Ford E Series Van Cab Cut-a-way. LUVERNE MegaStep® 6 1/2" running boards are the ultimate combination of side accessories, featuring the look and styling of popular nerf bars with the comfort and convenience of a running board. These running boards have 5" wide, non-skid rubber treads that extend the full length of the board to offer safe, secure entry into the vehicle. They also feature a strong, lightweight aluminum core with a high-polish stainless steel trim for a bright, clean accent on your vehicle. LUVERNE MegaStep® running boards mount easily with vehicle-specific brackets, pre-installed fasteners and an adjustable design to perfectly fit your unique vehicle. Usually ships within 1-2 business days Please allow an additional 1 - 5 business days for delivery to most US locations. Ships only by Fedex Ground or Home Delivery.